What if the new Kate Atkinson were even better than the last? That's the audacious question Atkinson's publisher asks on the proof of her new novel, A God in Ruins. Audacious, yes, but there's a reason it's okay to ask that question - because the new Atkinson is even better than the last. A God in Ruins is a companion novel to Life After Life. A companion, not a sequel, and there's a reason to not call it a sequel that you'll understand once you finish the book. The novel follows Teddy, the younger brother of Life After Life's protagonist Ursula, through the Second World War and across the years, also taking in his descendants. And that's about all I can say about the plot of A God in Ruins, because anything further would take away from your enjoyment. What I will say is that A God in Ruins is as magical as Life After Life, and it's also a novel that is absolutely stunningly crafted, without the craft ever taking away or distracting from the story. The artistry with which Atkinson writes is awe-inspiring, and her explanation of this book in a lovingly put together author's note just adds to the beauty of the book. 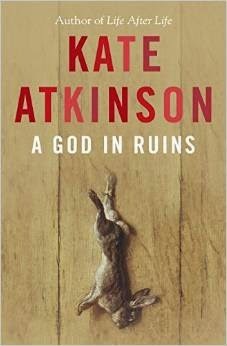 Atkinson's knack for creating wonderful characters you want to spend time with rears its head again in A God in Ruins. I thought no one could top Ursula from Life After Life, but somehow here Atkinson raises the bar. Teddy is even more compelling than he was in Life After Life, and Atkinson also creates a raft of new characters who you love, and love to hate. Sunny in particular broke my heart over and over, while his mother deserved many a good slap. A God in Ruins is partially so good because it's full of detail. Before I read this, I would have said that intricate information about planes flown during the Second World War and the minutiae of what each person on a plane did would be boring to read about. But in Atkinson's hands, all those details became fascinating, and I found myself hanging on to every word. 'What if' was the premise of Life After Life, so it's fitting that a what if question is what greeted my reading of A God in Ruins. What if the new Kate Atkinson were even better than the last? Well, it is, and it means that you're in for an extraordinary reading experience. *A God in Ruins in out in the UK on May 7, 2015. How I got this book: From the publisher, Doubleday, this did not affect my review.